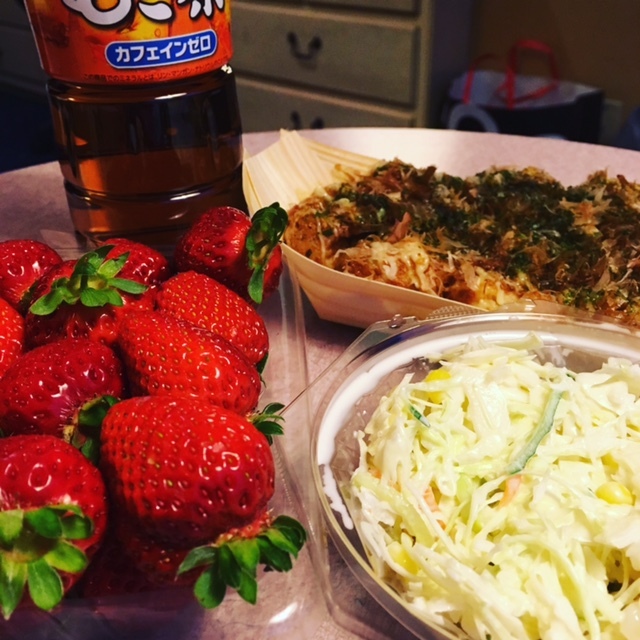 We kept to our frugal ways in Japan, and came home with over $150 out of our trip budget as well as more than a few goodies. Our low-cost phone plan with T-Mobile provided free WiFi and texts while we were in Japan. Combined with Facebook Messenger we were able to easily communicate with our son and with Meiling and WenYu back in the U.S. without incurring any extra costs. We will never leave T-Mobile! A travel-size tube of Aleve costs $3.79 on Kaua’i. The same tube was 49¢ at the Navy Exchange at the New Sanno Hotel, so I bought one more to bring home and will refill it from our regular supply as needed. I also brought home all the soaps and shower gel that were provided in our hotel room every day. We had to use American dollars in the Sanno Hotel and at the Exchange, and decided to save all our change, $1 bills and $5 bills while we were there. We ended up bringing home $87.43 (!!) for our change/$1 bill jar and to put toward future travel. Even though we came home to an empty refrigerator and nearly empty pantry, we stuck like glue to our shopping list and stayed under budget when we did our monthly shop at Costco, Walmart and Big Save. We filled up the car while we were at Costco – gas was just $2.67/gallon (very low for here). We buy all our gasoline at Costco – they always have the lowest price on the island. Our little Honda Civic gets 36 mpg, and we pay around $80 per month for gasoline, even though we initially budgeted $300/month. We actually drive more miles here per month than we did on the mainland because Brett and the girls got free public transportation there. Buying our gas at Costco also increases our annual rebate. Starting next month we’ll be moving into extreme saving mode, in order to have enough for our Big Mystery Adventure™ in 2018! I almost gave up on this giveaway because not one of the bird cookies we bought made it home without a crack (which will teach us not to purchase them unless they are packaged in a tin). 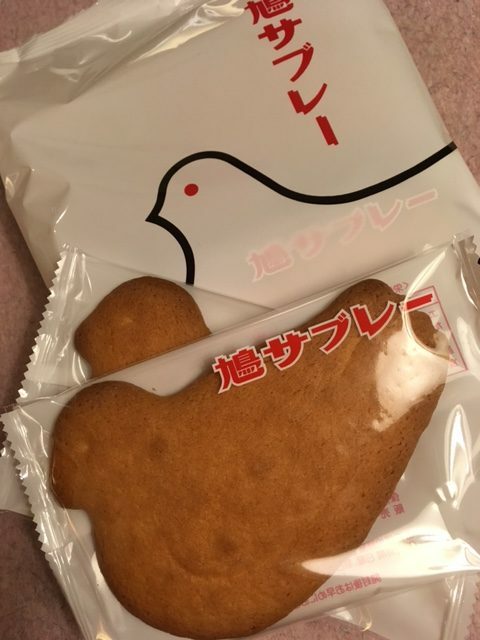 But, I decided that a cracked bird cookie will still taste as wonderful as one that isn’t, so I decided to go ahead and am offering a gift pack of five of Kamakura’s famous “bird cookies,” Hato Sabure, for my first Japan Giveaway. 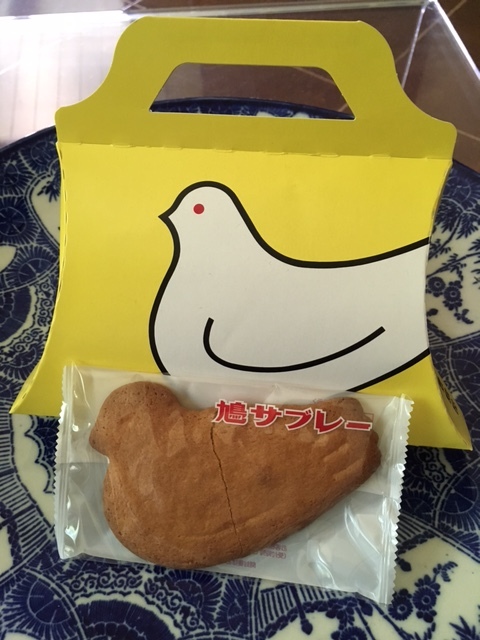 In Japanese, hato means pigeon, and sabure is the Japanese pronunciation of sable, a type of French butter cookie. 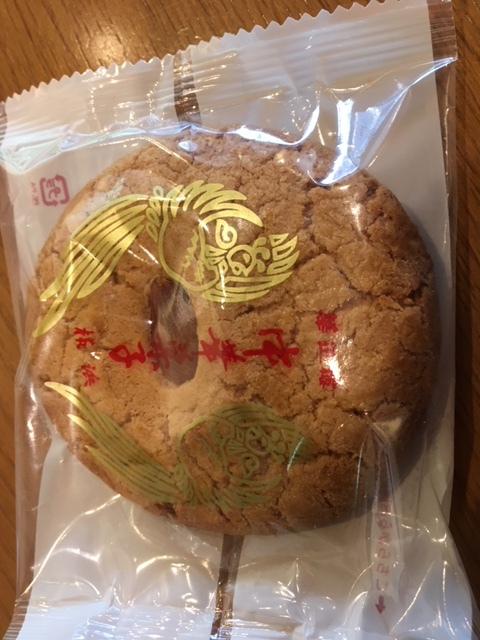 Once only available in Kamakura, today the famous cookies can be found in the food sections of higher-end department stores throughout Japan. These big, crisp butter cookies are divine (even if they are cracked). They’re perfectly sweet, go wonderfully with coffee or tea, and are great for an afternoon snack, to pack in a lunch for a special treat, or to enjoy any time really. Hato Sabure are one of my favorite reasons to visit Japan. The giveaway will be open for a week; the latest you can enter is midnight HST, on Wednesday, April 5. A winner will be chosen at random from all entries and announced in the blog on April 6. Comment on this page. You can comment every day until the giveaway, but just once a day. The more entries you have, the greater your chances of being chosen the winner! I will post the link a couple of extra times during the week. Commenting in another post will not count. Subscribe to “The Occasional Nomads.” If you are already a subscriber, you will receive one extra entry. Please comment below and let me know that you are already a subscriber or that you just joined. Post about the giveaway on your own blog, if you have one, and receive one additional entry. The winner will be announced in the blog and also notified by email. You must respond by comment to the blog or to the email to receive your bird cookies (I will email you back to find out where to send them). Also, I can only mail to addresses in the U.S. and Canada. OK, I admit that it has been wonderful not having to plan meals, or cook, or clean up the kitchen for over a week. But, vacation is over and it’s back to real life. One of the things we greatly enjoyed in Japan was the wide selection and affordability of prepared foods. If you don’t feel like cooking it’s very easy to stop at a nearby grocery or department store and pick up everything you need to put together an easy meal, from fish to chicken to just about anything you can think of. We did this a couple of evenings when we didn’t feel like going out, and were frankly surprised by how little it cost to have a tasty meal without any effort except for carrying the bags of food back to our room. We’re picking up a roast chicken when we do our big shop at Costco today so chicken will feature in three evening meals as well as chicken salad sandwiches in one of YaYu’s lunches. We’re also looking forward to returning to the farmers’ market this week for plenty of fresh produce. We’ll pick up fresh green and red peppers, and celery, at Costco as well as frozen green beans, and will get cabbage, cilantro, zucchini, tomatoes, carrots, cucumbers at the farmers’ market as well as some bananas and papayas. Both Brett and I will be watching our carbs from now on. He will still be eating rice and such, but will be measuring his portions carefully. I’ll still be avoiding them as much as possible, although we did buy some of my favorite raisin bread to bring home – I want to have one slice a week for breakfast. The pieces are much smaller than bread in the U.S. so hopefully one slice won’t bother me too much. Both Brett and I are out of shape, much more than we realized. We’re both overweight, and in my case carrying around a few too many extra pounds caused my bursitis to act up from time to time. When I weigh less, it’s not an issue. We need to get more exercise than we do now so that we have more stamina no matter where we go. Brett’s going to start taking a walk on the beach path every morning, and I’m going to punch up my bike riding. When I get my weight down and the bursitis under control I’ll join Brett on the longer walks. Long plane trips affect us more than in the past. Even with the more comfortable seats we booked for this trip, the long plane ride over affected my back somewhat, and Brett said it was hard on him too. Fortunately I knew what to do about my back this time to ward off major problems like I experienced last summer, but we realize it’s something that will always need to be considered going forward. Visiting Japan will always require a long flight, but we may have to consider breaking up other journeys into shorter sections, with a period of rest in between. We need much, much better shoes for walking. The shoes we took with us this were not made for walking any distance, and we walked miles each day. Our feet more than let us know that we need better shoes. Before we do any more traveling we are both going to invest in some good-fitting, quality walking shoes. Jet lag affects us more than it did in the past. We noticed it took us a bit longer to recover this time than it has in the past. We’re getting older, and don’t bounce back like we once did, so it’s something we’re going to have to consider for future trip and plans. We’re still open to adventure. We continue to enjoy trying new things and new foods, and going places and doing things we haven’t done before. We’re still very good at packing just the right amount. We brought just the right amount of clothing: five days of outfits. 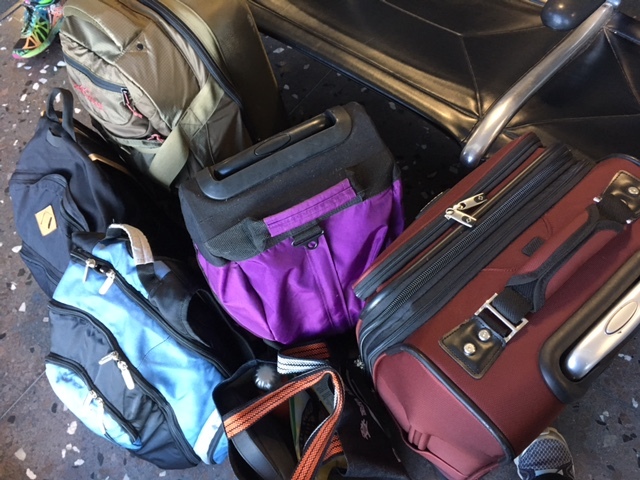 Everything fit perfectly into our carry-on bags, with room for gifts coming over, and plenty of room for souvenirs going home. We’re still flexible. We’ve been able to adjust our plans easily without throwing everything off, or feeling disappointed. We had an unexpected rainy day earlier in the week, but quickly changed our plans and had a wonderful time exploring the area around Tokyo Station (which was mostly covered) with our son and grandson instead of heading out on our own to a more distant part of the city as we had planned. We’ve gotten even better at managing our travel funds. Lots of things catch our eye (and boy have they this trip), but we’ve been even better at telling ourselves no, that we don’t need something, and reminding ourselves that we’d much rather use our money for other things, like being able to splurge on our grandchildren, and do some special things for our son and daughter-in-law. 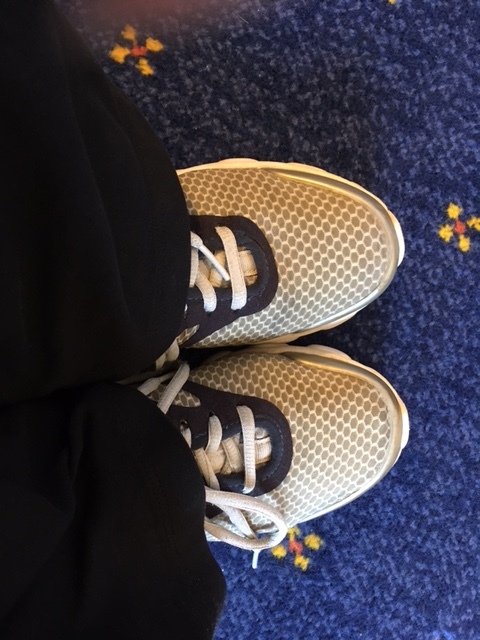 We won’t be traveling again for the rest of this year, and for at least half of next year, so we have time to get ourselves in better shape, plan an affordable flight schedule that works for us that includes some built-in rest periods, and find better shoes for walking! It’s good to be home, but I can’t wait to go back! The view from our son’s apartment – we’re going to miss this busy, vibrant city! It’s Sunday evening here in Tokyo. I almost can’t believe that this time tomorrow we’ll be on our way home to Kaua’i. What a great time we’ve had! We’ve thoroughly enjoyed each and every day, and seen and done everything we wanted to see and do. The only thing we could want more of is time with our son, daughter-in-law and beautiful grandchildren. The New Sanno Hotel has been an absolutely fantastic place to stay. Our room has been exceedingly comfortable, with every amenity imaginable, and we’ve loved being able to have our son and grandson come over to swim a few times this week. Having a Navy Exchange on the property has also helped us save, and let us indulge our son’s love of Diet Coke! I’m ending our vacation with a trip to the local police station. It was raining this morning when we were walking to our grandson’s soccer practice, and as we walked along the street I saw something shining on the sidewalk and bent down to pick it up. It was a thin silver ring, like a wedding band, but as Brett and YaYu had gotten far ahead of me at that point I put the ring in my pocket and kept going. I thought about putting it back, but then couldn’t remember where on the street I had found it. But, as the day went on I was feeling badly about having it, and this evening looked inside and saw a very tiny ‘Chanel’ marked inside as well as some numbers. I plugged it all into Google and voilà – there was the ring on the Chanel site! It is made of platinum, and has a retail value of more than $1530!!! Yikes! So, after we check out of the hotel tomorrow morning my son and I are going over to the local police station to turn the ring into lost and found because I know someone here would do the same if I lost something, even if it was just a cheap plastic umbrella. You just don’t take things you find here and keep them. 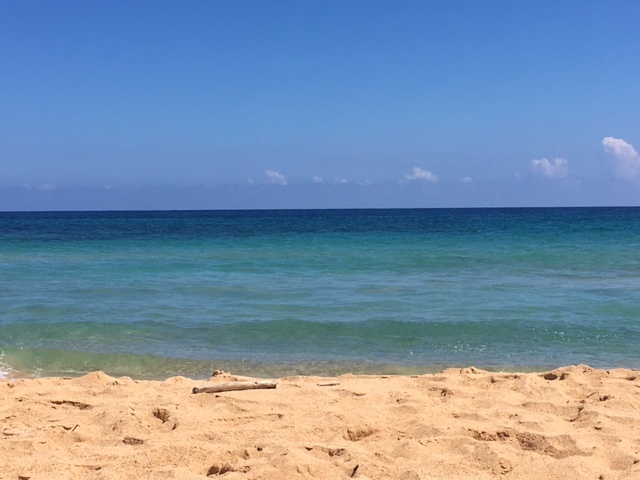 There will be absolutely nothing to eat in our house when we get home to Kaua’i, so we plan to stop at Pono Market in Kapaa on the way home from the airport to pick up a few things to eat, as well as find something to put in YaYu’s lunch on Tuesday when she heads back to school. Brett and I will be heading to Costco, Walmart and Big Save on Tuesday to do our monthly ‘big shop’ and replenish our fridge, freezer and pantry for the month. 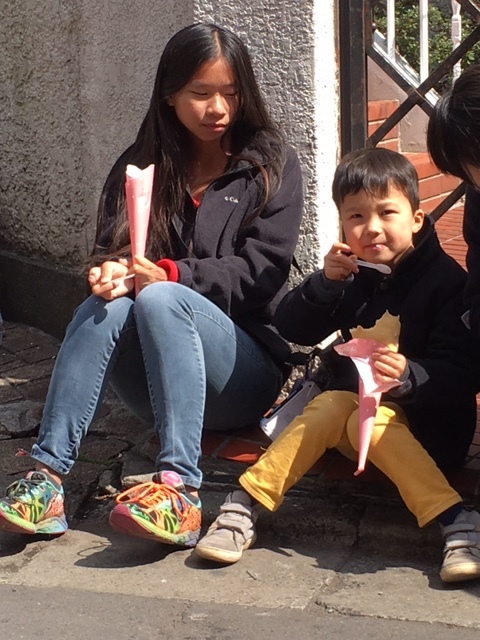 YaYu and our grandson enjoy Angel Heart crepes in Harajuku. Our daughter-in-law thought she would get to share with our grandson, but he ate the whole thing all by himself. Reading: I’m ashamed to say I haven’t picked up my book even once this week. We’ve come back to our room every evening and collapsed. Listening to: We had our grandson here at the hotel with us this evening, but he’s gone home to bed because he has to be up early to go on a field trip tomorrow, and the room seems quiet and empty without him. Brett and YaYu have fallen asleep, and I’m about to drop off. Watching: We haven’t watched very much TV here, although there are plenty of channels available. I’ve actually missed seeing any Japanese TV – it can be very wacky (along with completely unintelligible). You can take the girl out of China, but you can’t take the China out of the girl. YaYu was in heaven getting to have a huge bowl of spicy ramen and some fried rice. 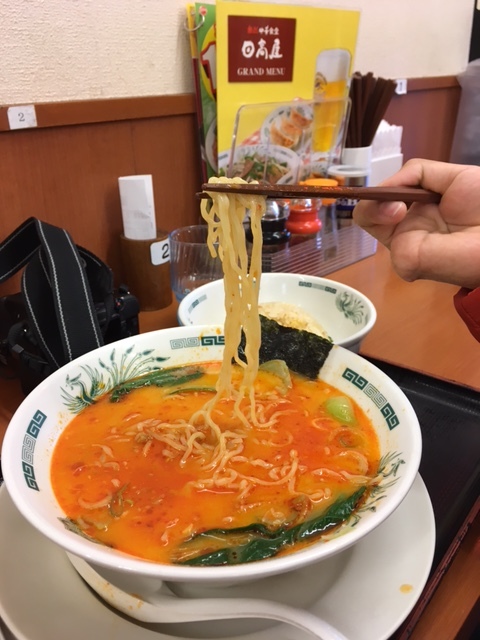 Chinese food in Japan is popular, delicious and very affordable. Eating: Since last week’s visit to the curry restaurant, we’ve enjoyed tonkatsu (pork cutlets), Chinese food in Chinatown, shrimp & vegetable tempura for dinner one evening, as well as those only-in-Japan treats. YaYu was determined to have ramen here, and finally got to enjoy a big bowl of the stuff at a stand/restaurant when we visited Asakusa to see the Sensoji temple. Happy I accomplished last week: We got to babysit our grandchildren not once, but twice, this past week, and we got to take our grandson out to lunch one day. He also spent this evening with us at the hotel, which was a delight. For fun we ordered from room service (very affordable at the hotel) which he thought was a lot of fun. 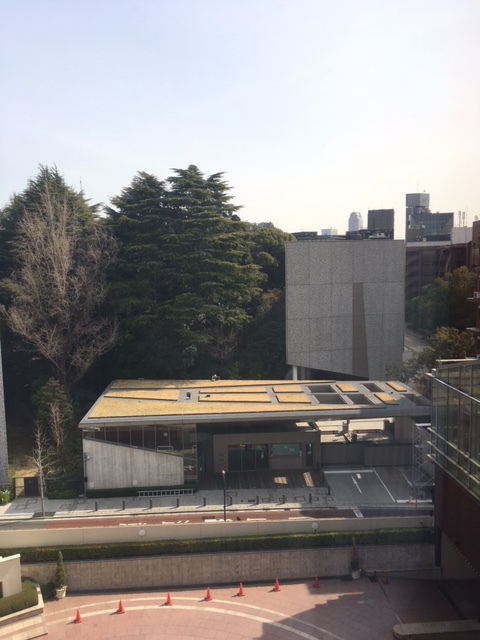 This week we got to walk the Ginza in Tokyo and shop at Ito-Ya, the famous paper store; visit Tokyo Station and the surrounding area; spend a full day in Yokohama and tour the Cup Noodle Museum as well as visit Chinatown and the Takashimaya department store at Yokohama Station; visit the Meiji Shrine and Harajuku; and go to Nakamise and the Sensoji temple in Asakusa. In other words, we did everything on our list except visit Kamakura, which we decided would just be too much this time. We have one more task tomorrow morning besides the visit to the police station – a trip to the bakery to pick up some raisin bread to bring home. Otherwise we’re packed and ready to go. Our plane leaves at 7:00 p.m., so we will catch the express train at 3:30-ish to be out to Narita by 5:00. Looking forward to next week: I’m feeling very sad about leaving Japan because I know it will be a couple of years before we can get back, and our grandchildren will grow and change so much before we can see them again, but at the same time I’m looking forward to being home on Kaua’i again, enjoying the memories we’ve made and some of the treats we’re bringing home with us. I’ll also be announcing the first of three Japan-related giveaways on the blog later this week! 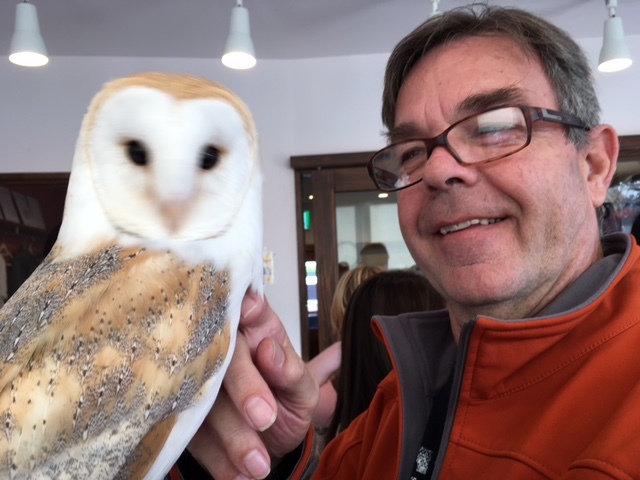 We had a fun visit to the Owl Cafe in Harajuku. 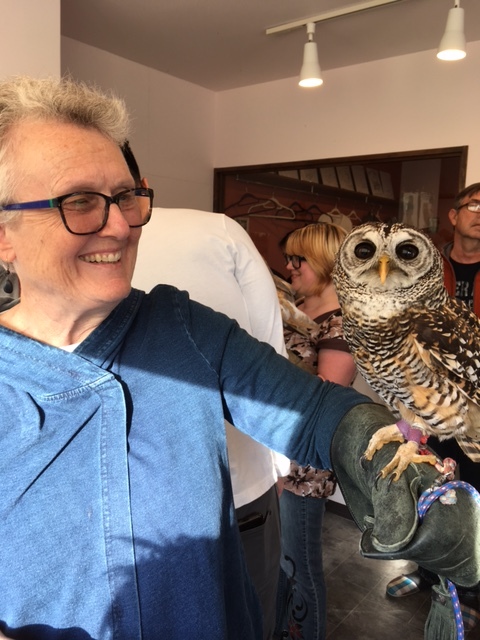 After having some tea we got to interact with several owls, which ranged in size from huge to tiny. Thinking of good things that happened: We enjoyed treating our son and family to the fabulous Sunday champagne brunch at the New Sanno this morning, and then having them stay for a swim this afternoon. 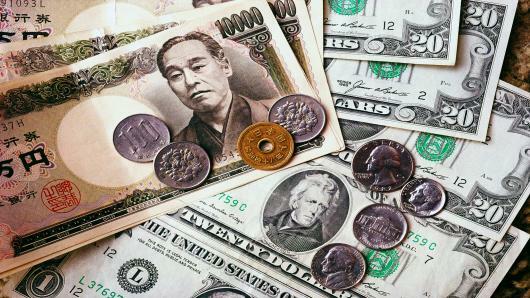 We will actually be leaving Japan this time with money in our travel account. The only souvenirs we’ve bought for ourselves have been edible except for the omikuji (amulets) Brett and I bought ourselves for good fortune and luck at the Meiji Shrine, and a small Inu Hariko, my favorite Japanese folk character, that I found at a folk craft shop near Sensoji. He’ll go on my bedside table when we get home. 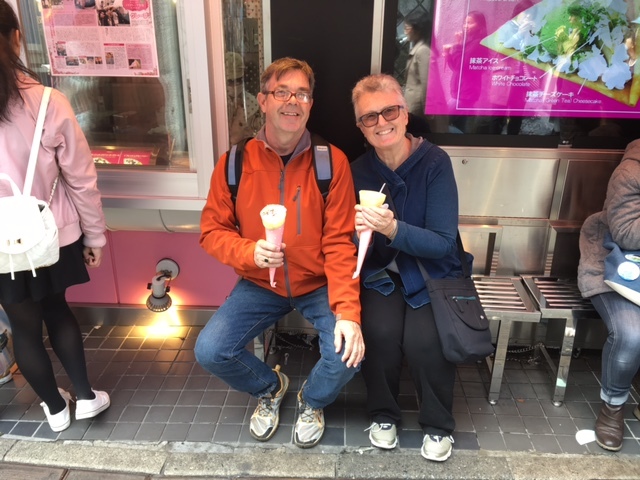 We also found two more flavors of KitKats yesterday, raspberry and green tea, when we stopped in a couple of convenience stores on our way back to the hotel to look for something else – we’re now up to eleven different flavors this trip! Other than a couple of rainy days we’ve enjoyed great weather all week, although it’s been quite cold at times (for us). Grateful for: Once again we have been so thankful for our son’s and daughter-in-law’s help with translations and getting us around all this past week. We could have managed on our own, but not as smoothly or easily as it’s been with their assistance. They’ve also bought many of our train/subway tickets, taken us out for several meals, and helped us experience things we would have otherwise missed. This vending machine sits outside a small cafe & bakery (which sells coffee and tea), and has a selection of water, hot and cold teas, and hot and cold coffee drinks – most cost around $1.20. 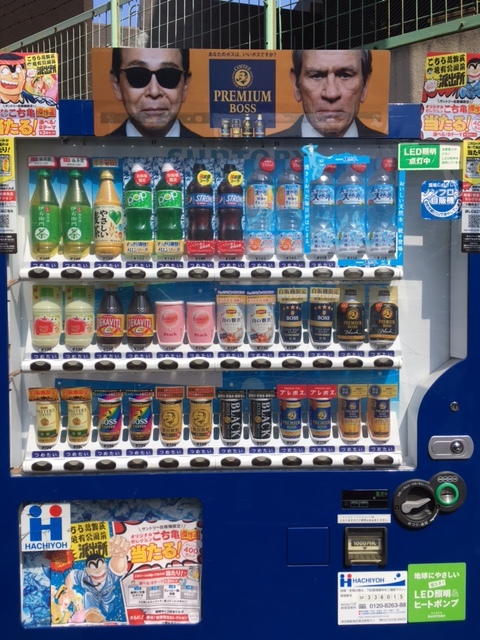 The man wearing the sunglasses, in the picture with Tommy Lee Jones at the top of the machine, is Tamori. He’s a comedian and has been a star here since I first came to Japan in 1971 – the sunglasses have always been his trademark. 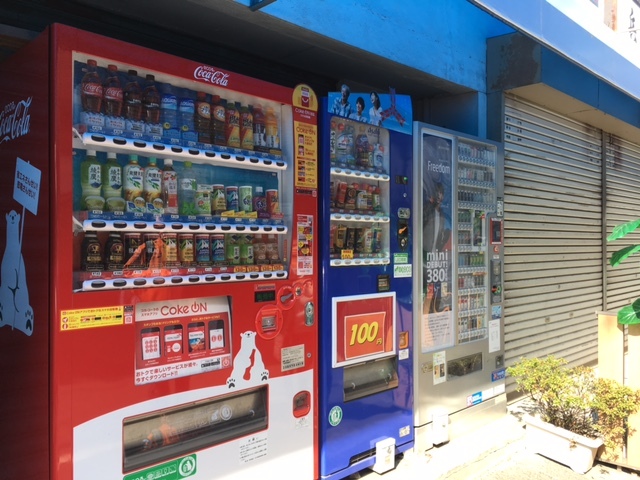 It’s so Japanese-y: Vending machines (jidō hanbaiki) are everywhere in Japan. Everywhere. You will find them on street corners in residential areas, in busy train or subway stations, outside convenience stores and supermarkets, inside department stores – everywhere. Most sell drinks such as hot or cold coffee, juices, energy drinks, or water and tea, but you can also find machines selling beer, whiskey, sake, magazines, cigarettes, umbrellas, neckties, hot noodles, books, ice cream (including ice cream cones), crepes, fruits and vegetables, eggs and well, just about anything you can think of. It’s just part of life in Japan. Many vending machines that sell drinks in plastic bottles and cans have a recycling center either built in, or right next to the machines. You’ll never see a bottle or can just thrown into the street. That’s all for this week! It’s back to our regular routine next week, but even though we’ve had a wonderful trip I’m sort of looking forward to regular again (whatever that means). How was your week? What good things happened for you? Strawberries are in season here, so patisseries all over are filled will strawberry shortcakes as well as other delights right now. 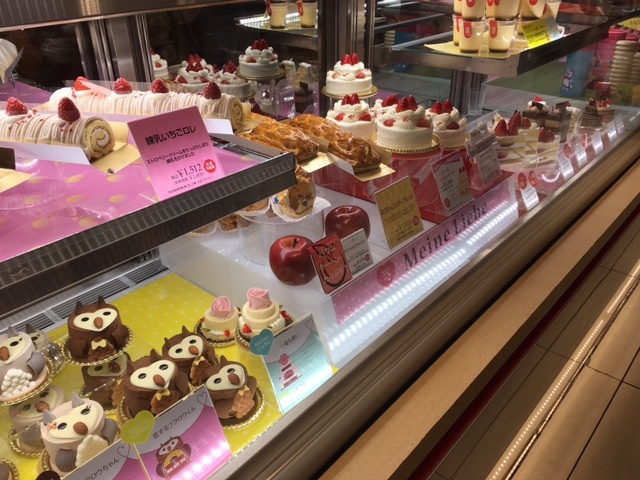 It’s not the first thing you think of about Japan, but one thing done very, very well here are sweets and other treats. It’s not hard to find incredible desserts here, as well as tasty cookies, crepes, cakes, and other delights. Starbucks Japan does flavors you can’t find back in the U.S. Best of all is that portion sizes are smaller than are found back in the States, and treats here contain far less sugar than American sweets while remaining incredibly tasty. Add both of those to the amount of walking that’s done here, and it’s OK to indulge once in a while. 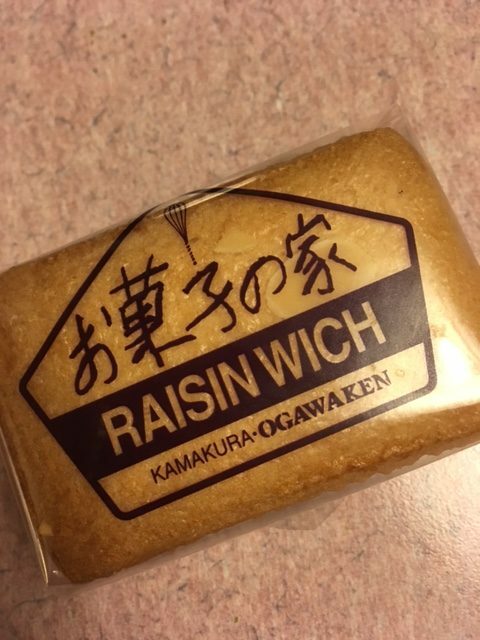 Raisin sandwich cookies, filled with a sweet creme and raisins, are one of my all-time favorite Japanese sweets, but while they were very popular years ago these days they’re somewhat harder to find. So, when we discovered some at the Daimaru department store in Tokyo Station this week, we bought a box of five. For three evenings I enjoyed one with a cup of coffee after dinner (Brett and YaYu had the other two). The cookies were quite small, about 1.5″ x 2.5″ in size, but just as delicious as I remembered them. Bird cookies! We bought a simple bag with 10 of the delicious, Kamakura-made Hato Sabure for Brett and YaYu to enjoy, as well as a couple of smaller gift packs to send to Meiling and WenYu after we get home. I had a bite of Brett’s crisp, buttery cookie (and it was wonderful), but otherwise I’m planning to avoid them, or will at least try because I could easily eat the entire package without blinking an eye. Our son suggested an afternoon break at Mr. Donut while we were in Yokohama on Wednesday. 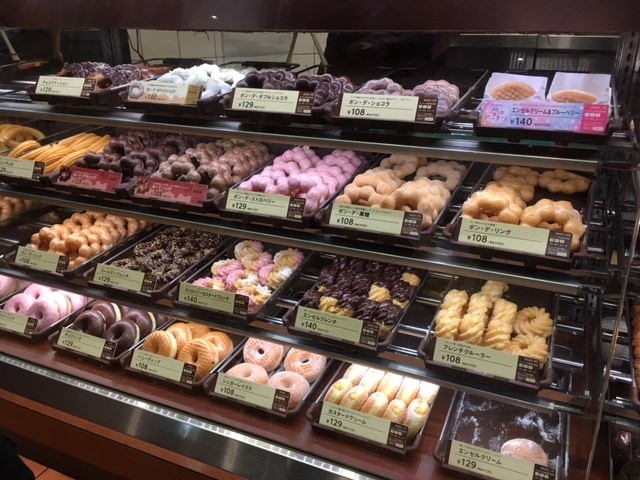 Donuts in Japan are smaller than what you find in the U.S., and far less sweet, but still very, very tasty. I was hoping for a green tea donut, but they didn’t have any at the shop we visited so I chose a blueberry and cream filled donut instead (delicious!). Our grandson had one of the pink and white ones seen in the middle of the case, a strawberry creme-filled ring, and Brett and our son both had ones with chocolate. Mr. Donut also sells savory donuts, but they kind of scare me. While we were in Yokohama we visited Chinatown, and stopped at a bakery to pick up five of the area’s famous almond cookies to enjoy later. They are only minimally sweet, but so good. Just looking at this cookie in the wrapper has me rethinking my resolve to avoid carbohydrates. 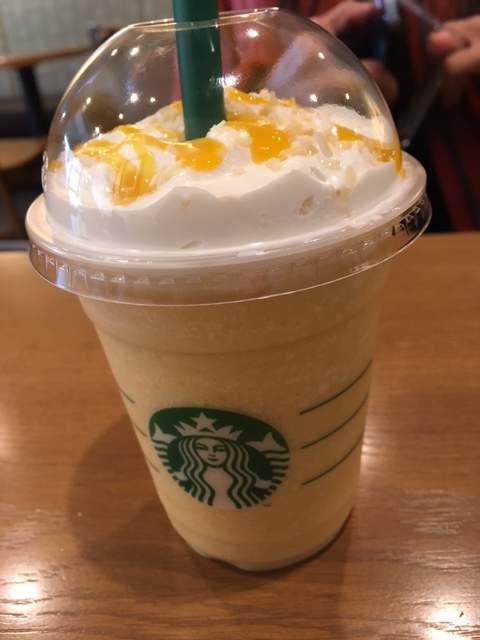 Starbucks Japan has introduced a new spring Frappuccino flavor: Sunshine Mandarin-Mango, with coconut and mango puree on the top. Can I just say it was amazing (and I don’t even care all that much for Frappuccinos)? YaYu tried one the other day, and after Brett and I each had a small sip we all decided that we wanted one at Narita for our last Japan treat before we board the plane to come home. They’re that good. All the above treats came from the food section of a Muji Lifestyle store (where I could easily drop some serious money – it’s like a Japanese IKEA that also carries clothing). 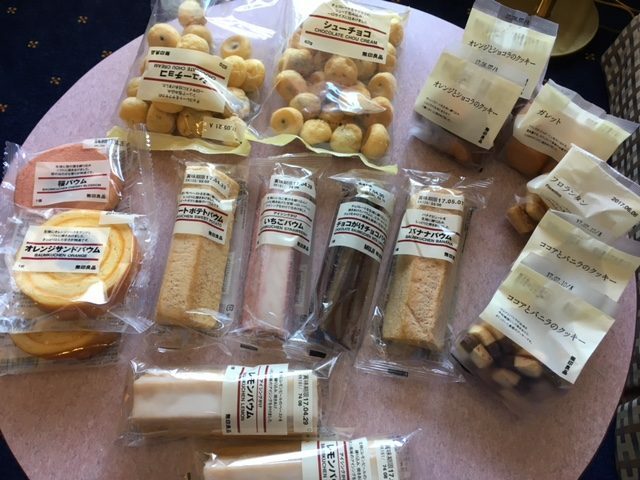 The very affordable, and all-natural, snacks we purchased, which include a variety of cakes, cookies and miniature chocolate-filled cream puffs, are all for YaYu’s school lunches. 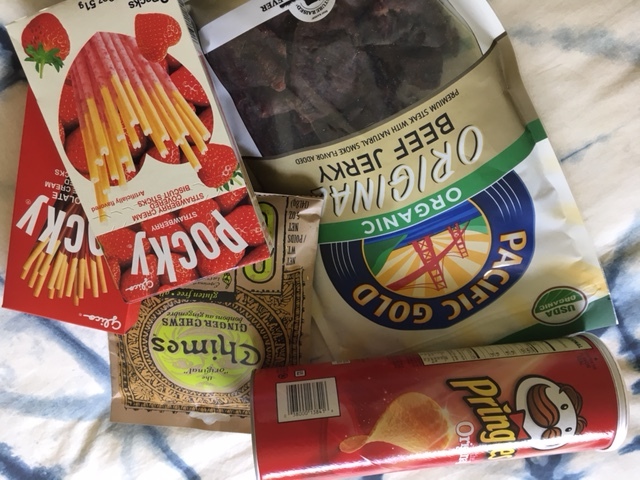 YaYu bought her own big bag of savory snacks there as well to share with her friends. The cake flavors above include lemon, chocolate, strawberry, banana, sweet potato, orange and cherry blossom. And, no trip to Tokyo is complete without having a fabulous crepe on Takeshita Street in Harajuku. Yes, I indulged. 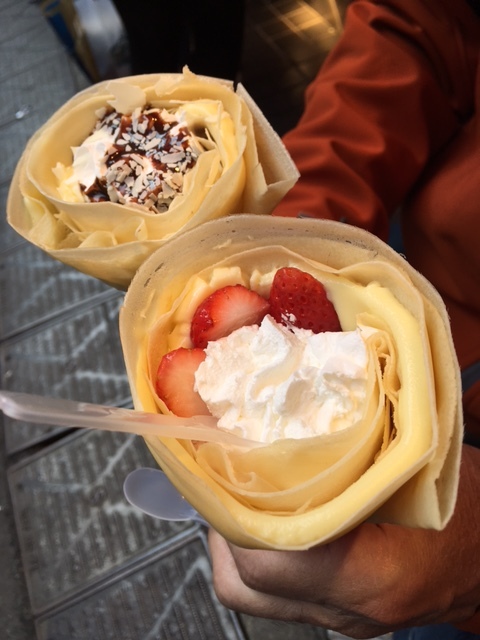 There are several shops selling crepes, but my favorite is Angel Heart Crepes, a small shop that offers nearly 100 different varieties of filled crepes in every flavor combo imaginable, with some including an entire slice of cheesecake. I failed to get a picture of an amazing dessert YaYu bought the other day: a strawberry and whipped cream “sandwich,” with the “bread” made from angel food cake. The sandwich was packaged and looked just like any regular sandwich you’d find for sale at a deli or supermarket. When YaYu saw what it actually was, she said she had to try it and it did not disappoint. Only in Japan. And, of course there are the KitKats. We visited a KitKat “chocolatory” at Tokyo Station earlier in the week and found four new “Tokyo-only” flavors: strawberry-maple, pistachio-raspberry, butter (yes, butter! ), and green tea-kinako (roasted soy flour). We’re not sure what to expect from that one, but will give it a try. We found some dark chocolate KitKats at the Daiso store in Harajuku, but will wait to look for more flavors at Narita, where souvenir shops offer lots of different flavors for travelers to take home with them. Both options are quintessentially Japanese, but we always choose the second one, and this is the walk we take each day. While most of the area is residential, there are also a few businesses along the way. There are also several vending machines interspersed on the road, most selling either hot or cold drinks, or cigarettes. The street is very clean. There is absolutely no trash, and the sidewalk is swept the entire way. 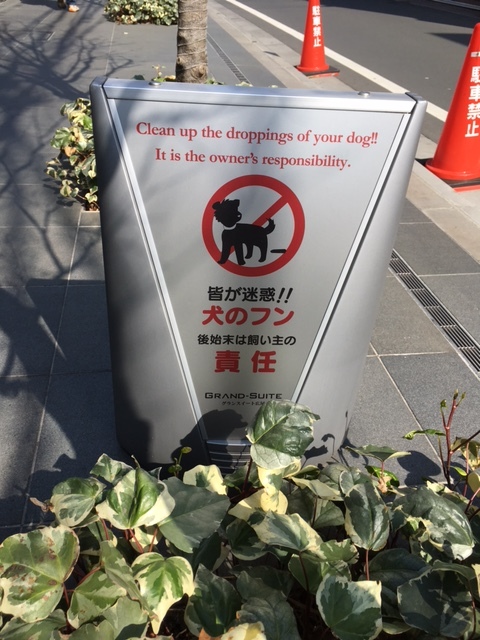 Japanese are master recyclers, and on trash days bags are neatly set out in designated areas with each type of trash/recycling separated for pick up. If there is a large pile of trash, the bags are covered with netting so they don’t spill out into the street. Occasionally we see an old house among the new. The land the house sits on is extremely valuable, worth millions of dollars. Building a new house would also cost millions, so the owners tend to hold on to their old house as long as possible and then sell the land to a developer. 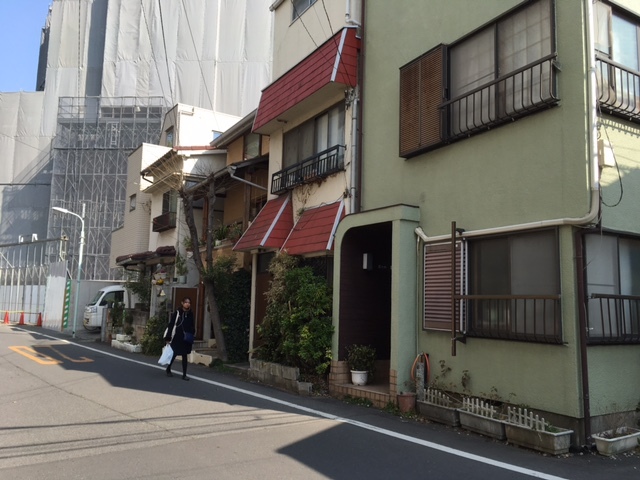 More older-style homes, probably from the 1970s and 1980s, with a new high-rise condo going up in the background. Almost every house and condo has plantings in the front, or at least some potted plants. 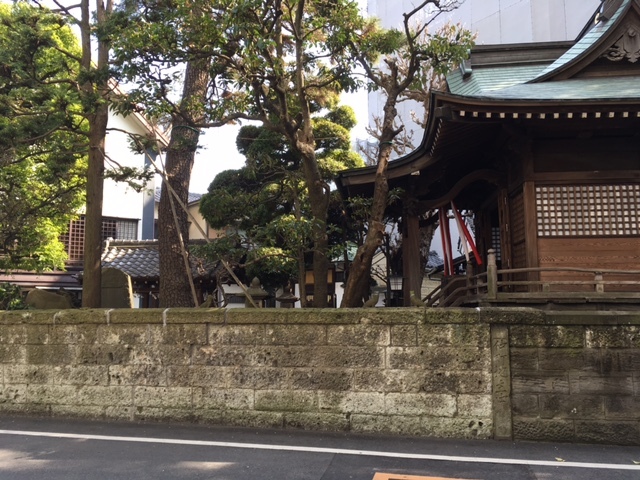 We pass a small neighborhood Shinto shrine on the way. 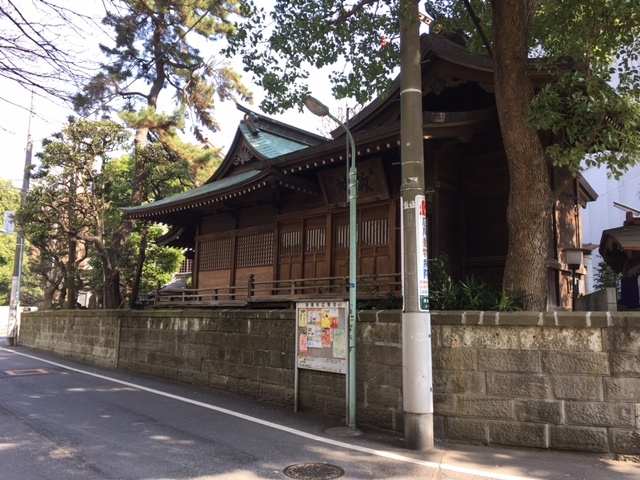 This is one of the things I love about Japan, finding a very traditional shrine or Buddhist temple mixed in with modern homes and condos. Local festivals and services are held at the shrine throughout the year. 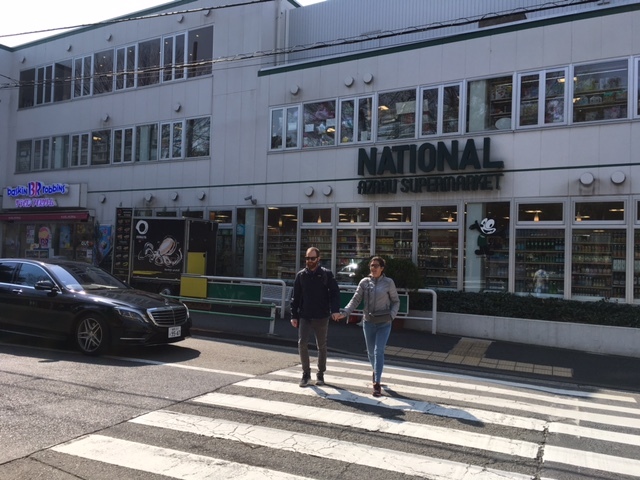 Halfway to our son’s condo is the National Azabu supermarket. 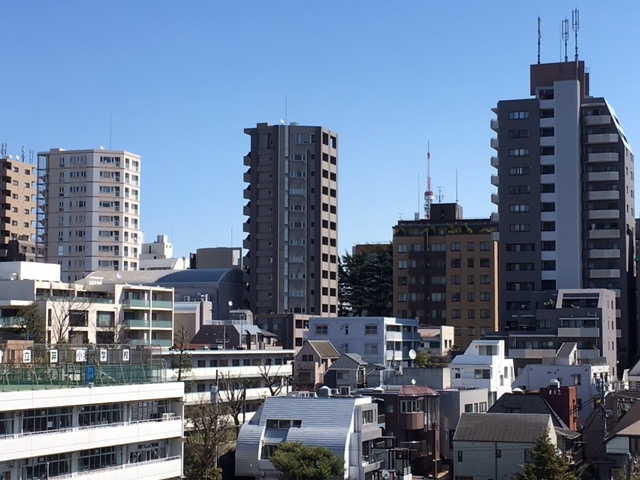 The neighborhood contains many embassies, so there are lots of foreigners living in the area, and National Azabu carries a wide selection of “foreign” foods, although you will pay dearly for them. A container of Fage yogurt that costs around $4 back in the U.S. is approximately $19 here, and a western-style beef roast, if you must have it, will cost you your firstborn. A studio apartment in the neighborhood can start at $2000/month, and prices go up from there. 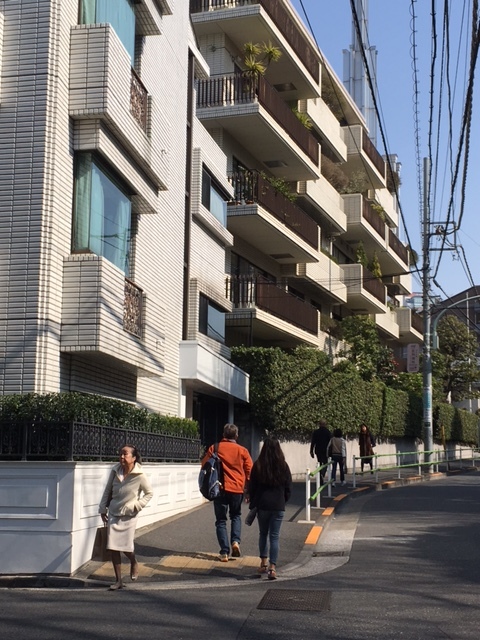 Many of the apartments in the neighborhood are larger than a typical Japanese residence, to suit Western tastes, and have amenities like dishwashers, ranges with ovens and such, things not typically found in Japanese homes but that appeal to foreigners. We saw an ad for a 683 sq. foot 1-bedroom condo (new construction) that was selling for $1.25 million dollars! 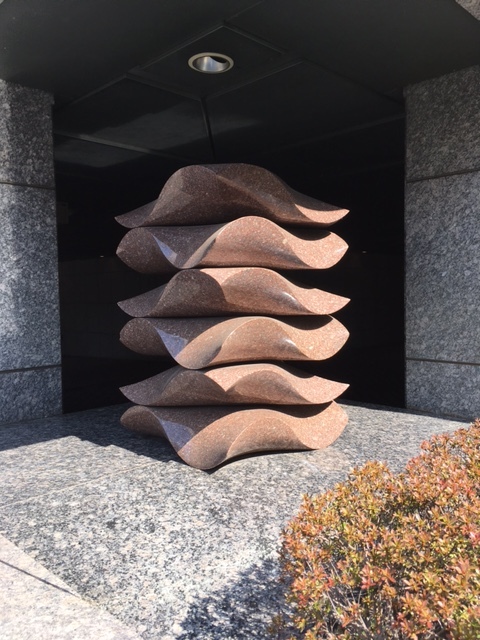 A sculpture adorns a corner of an apartment building along the way. 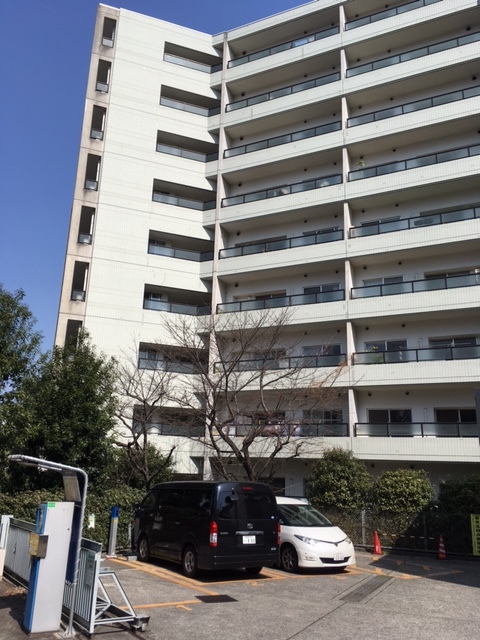 Our son’s condo is just nine stories tall, but all units open into an inner courtyard, which is a feature our son and his wife wanted after the big earthquake in 2011. 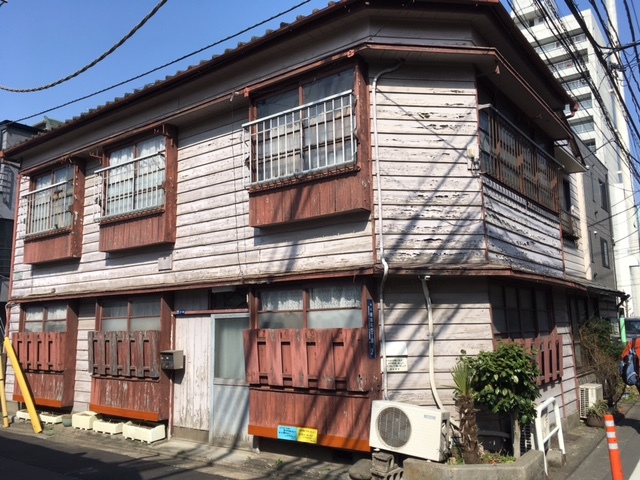 A mixture of foreigners and Japanese live in the building, and there is rarely ever a unit available for rent. An apartment/condo building will always have balconies; a commercial building won’t. 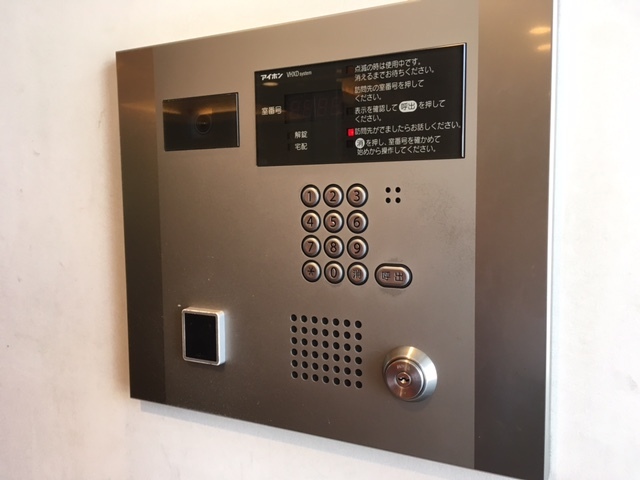 I have yet to go to any residence in Japan, whether it’s a house, condo, or high-rise apartment, that doesn’t have an intercom system used to announce your presence, whether you’re family or a tradesperson. Modern intercoms, like at our son’s condo, also have video capability, so you can see who is asking to be let in. 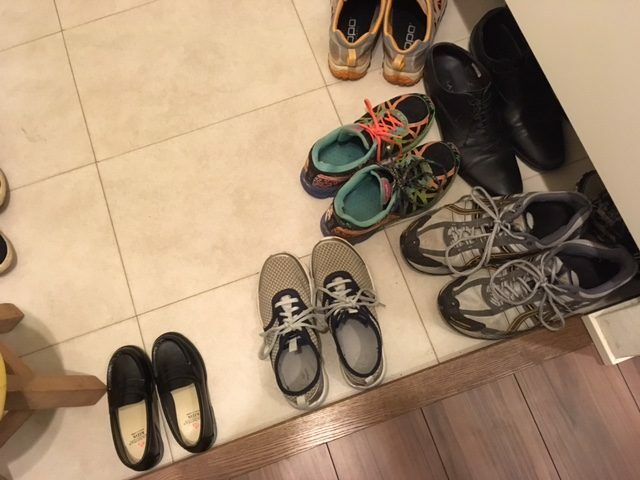 Everyone takes off their shoes in the genkan before stepping up into a Japanese home. When you take your shoes off, you turn them to point out so that all you have to do is slip them on to leave (we fail miserably at this). All homes have a spacious shoe closet built next to the genkan. What no photo can capture is how safe the neighborhood is. Cars watch out for people walking. You can walk alone at night and not worry about being accosted. You can leave your umbrella or your bicycle outside a store and it will be there when you come out. We had a nearly 4-hour layover in Honolulu before heading to Japan. The flight over was long, but comfortable – we were all very happy we had upgraded to the premium economy level. Brett said it felt like there was almost too much legroom! We were fed well, including a mid-flight snack of Ben & Jerry’s ice cream – that was a first. Delta provided a large selection of movies to choose from, and I was able to see La La Land (meh), Manchester By the Sea (excellent), and Florence Foster Jenkins (very enjoyable and fun) as well as fit in a short nap. Clearing immigration and customs was easy once we arrived at Narita, and our son and grandson were waiting for us when we came out. After that it was a short walk to catch the express train into Tokyo, with the ride to our station just slightly over an hour. We took taxis from the station over to the New Sanno and got checked in, then unpacked all the gifts out of our suitcases and got them into the appropriate gift bags and headed over to our son’s condo to meet our granddaughter and have a celebratory dinner of sushi and some other goodies. At that point Brett, YaYu and I though were about to drop dead – we had been up for nearly 22 hours! Our room is very comfortable, and we all had a good night’s sleep. 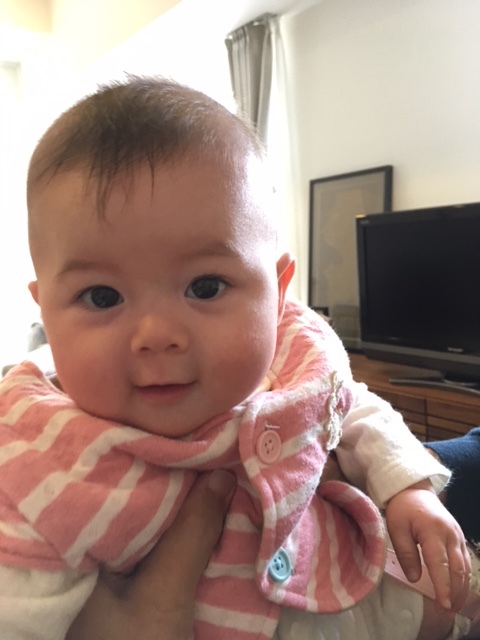 Our new granddaughter is a delight! She’s a very happy and easy-going baby, and lets each of us pick her up and hold her without any fussing. Our grandson is a bundle of energy and a load of fun to be around. He’s a fantastic big brother too – very loving and tender with his little sister. We had an enjoyable, and relaxing day today beginning with breakfast at the hotel followed by a walk to a nearby supermarket and bakery to purchase breakfast items we can have in the room starting tomorrow. 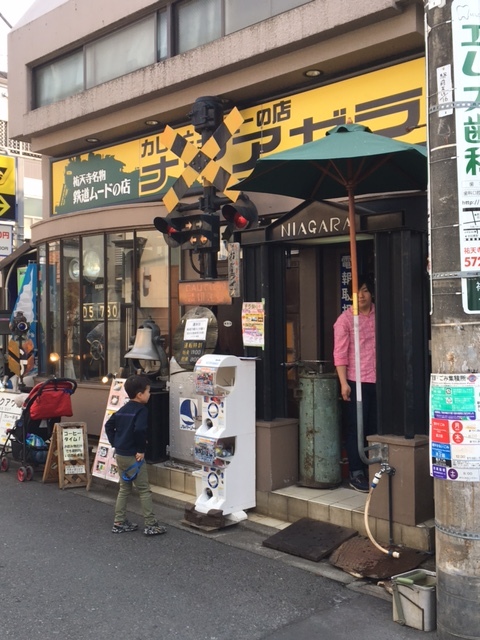 Then we headed over to our son’s and all of us went to the train-themed curry restaurant for lunch. It’s a small place that seats only around 15 people maximum, with the whole place covered in Japanese train and station memorabilia. Meals are delivered to the table via a large model train that runs around the restaurant! The owner and chef came out after we had finished and talked with Brett (who loves trains), and told him about many of the pieces he had collected over the years while our son translated. Then it was back to the hotel with our son and grandson for a swim followed by dinner at the hotel restaurant. Brett and YaYu have collapsed, but here I am wide awake! 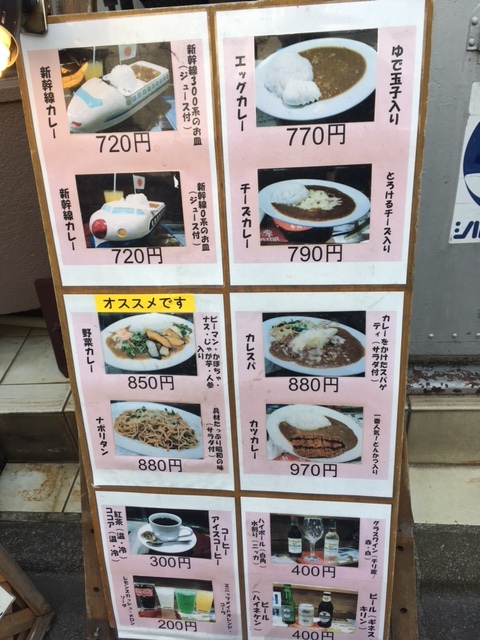 Menu choices are posted on a board outside the restaurant. In the upper left corner is the kid’s meal – it arrives on a train plate. Inside the restaurant, you actually order using a trai ticket machine! 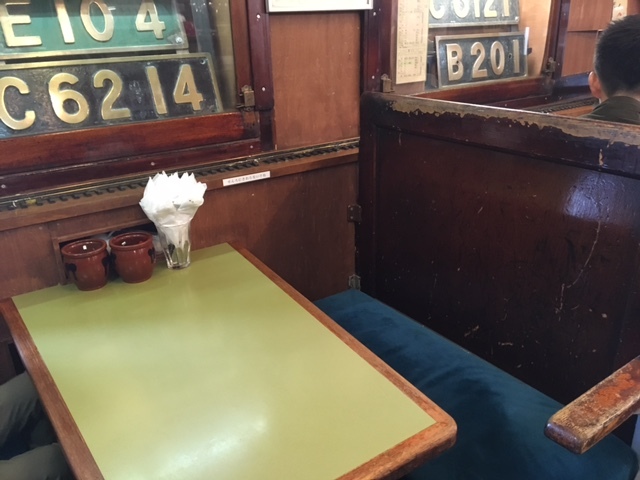 The seats for each booth are from old trains, with the original blue velvet upholstery. Track can be seen on the ledge beside the table – a model trains delivers each dish from the kitchen to your table – fun! 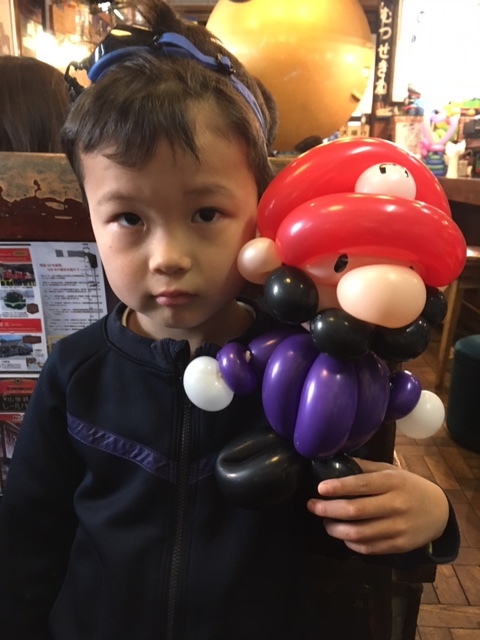 An employee of the restaurant makes balloon sculptures for children because usually everyone has to wait for a table. He made our grandson Super Mario this time. Reading: I brought along my Kindle but have not had time yet to start A Man Called Ove. Maybe tomorrow. Listening to: The room is perfectly quiet – both Brett and YaYu are sleeping. Watching: Nothing so far, although I want to check out Japanese TV while we’re here to see if I can understand any of it. One thing that’s quite different these days from when we lived here is that every U.S. cable channel is available for the military. Back then we had just one English channel (Far East Network) which mostly carried old or dated shows and loads of public service announcements. 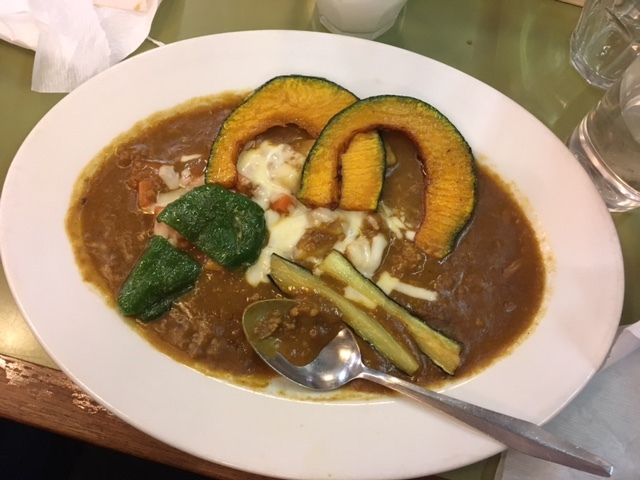 I had vegetable curry with green pepper, carrots, eggplant, and kabocha pumpkin – so delicious! Eating: We had American breakfasts in the hotel this morning – very good, very filling and very reasonable. Then lunch at the curry restaurant, and dinner again with our son and grandson at the hotel following their swim. Tomorrow we’re hoping to eat either tonkatsu (pork cutlet) or ramen while we’re out. Happy I accomplished this last week: We’re in Japan! Looking forward to next week: Tomorrow and the day after we’re babysitting our grandchildren, and tomorrow after we’re done Brett, YaYu and I plan to go to the Ginza to check out Ito-ya, a very old and famous paper store with 12 stories of all things related to paper, including one whole floor dedicated to pens and pencils. We’ll also hopefully have a chance to check out the Tokyo Kabuki theater, which is nearby. As for the rest of the week, we’re just going to play it by ear. Three of our favorite KitKat flavors: Rum raisin, wasabi, and strawberry cheesecake. We’ve already found a new flavor this trip: sake! Thinking of good things that happened: The KitKat hunt is off to a good start! 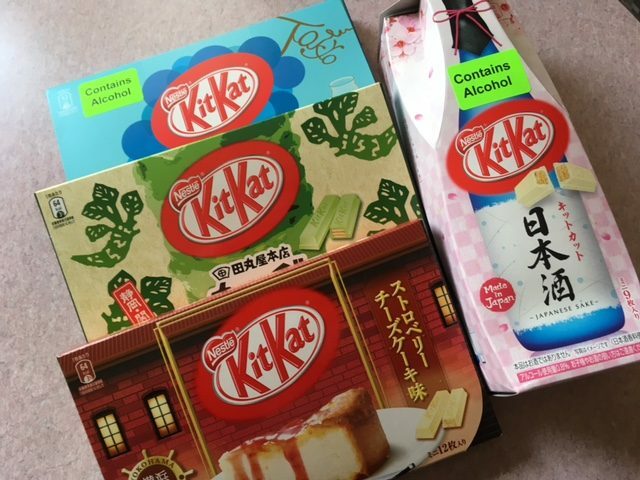 The small Navy Exchange in the hotel now carries KitKats, and we were able to get four different flavors, including a new one: sake, which contains real alcohol. Although I’ve been feeling like I haven’t been getting all that much from my Japanese lessons with Rosetta Stone, I’m surprised by how much I can understand now that I’m here, and how much I can read. I’m still incapable of putting a sentence together though. And, it turns out I don’t need to buy a pre-paid SIM card for my phone here. Our very affordable phone plan in the U.S. turned out to include free data and texting in Japan, and reasonable prices if we decide to call while we’re in country (which we would do only in case of emergency). $$ saved! 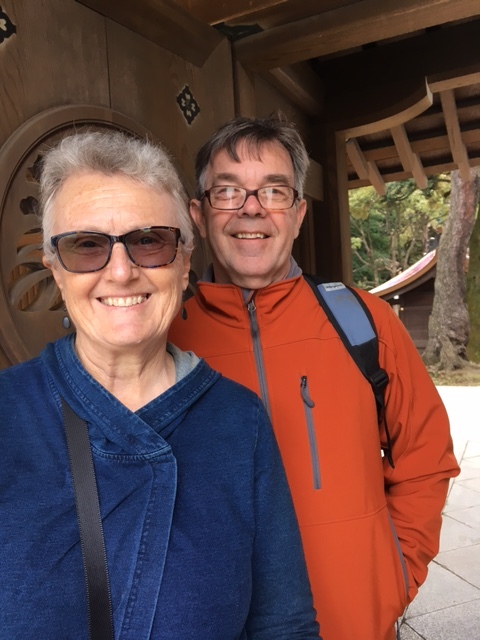 Grateful for: We’re all so thankful (and fortunate) our son speaks Japanese – in just the time we’ve been here he’s been hugely helpful making sure we understand what’s going on, that we buy the right ticket, that taxi drivers get us to the right place and so forth. And, we have the most wonderful daughter-in-law in the world. I’m not sure what we did to deserve her. Two treats: ohagi and sakura mochi. The ohagi looks black, but the sweet beans are actually a very deep purple. It’s so Japanese-y: I love Japanese sweets even though they’re not very sweet by American standards. 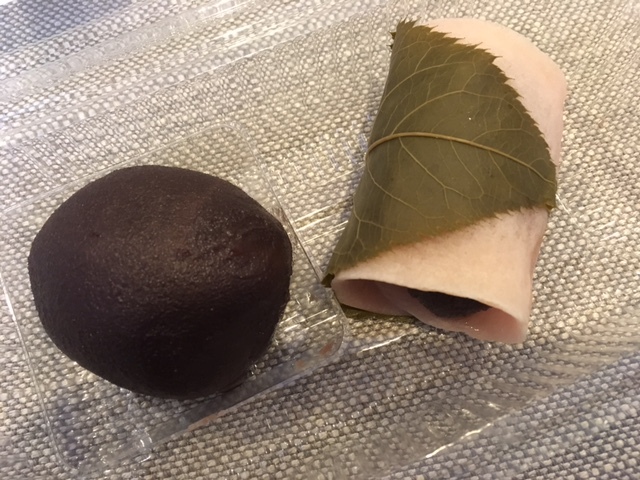 Today my daughter-in-law stopped at a wagashi (traditional Japanese sweets) shop on our way back to the station from the curry restaurant, and bought me a sakura mochi, my all-time favorite, made of sweet beans inside a thin layer of mochi, and then wrapped in a pickled cherry tree leaf. The briny leaf perfectly compliments the sweet mochi and bean filling. Sakura mochi is only available for a short time every year, around cherry blossom season which is coming up soon. Brett got an ohagi: a layer of sweet beens over a mochi filling. That’s it for this Sunday from Japan. How was your week? What have you been doing? What good things happened for you? 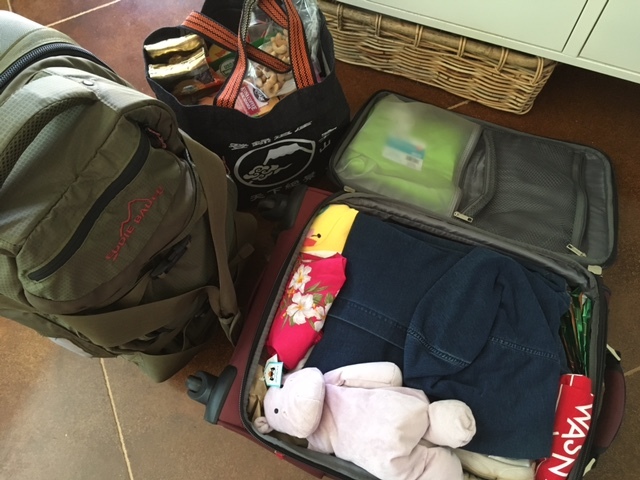 Everything fit into our suitcases and bags! Actually, we were able to get all the gifts into just Brett’s and my bags – we are ready to go! Meiling was hired for the summer position at the University that she interviewed for last week. The position will give her free room and board on campus during the summer, and a nice fat check right before she heads back to classes in the fall, enough to cover over half of her living expenses next year. We spent an absolutely lovely afternoon at the beach on Tuesday!